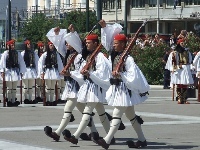 Syntagma Square, or Constitution Square in English, is named for the Constitution that King Otto was forced to grant to the people of Greece after a popular military uprising in September 1843. The square forms the heart of modern Athens and is home to the Parliament Building, built in 1840 as a royal palace. Tourists flock to photograph the unusually clad guards at the palace; the skirted and pom-pommed guard is changed ceremonially, every hour, in front of the memorial to the Unknown Soldier. There are two green areas planted with lots of trees in the north and south of the square which provide some welcome coolness on hot days. The National Gardens are around the Parliament Building and they are a delight in the heat. The square is a central point of access to all the major attractions of Athens, particularly 'museum mile' along Vassilissis Sophias Avenue, which runs from Syntagma Square. Here most of Athens' museums are clustered, including the Benaki Museum, Museum of Cycladic Art and the Byzantine Museum. Syntagma Square is also a transport hub with a metro station. Recently, the square has been the gathering place for mass protests against austerity and during these demonstrations it is best avoided by tourists.